Helloooo my wee pals! I’ve just returned from my first proper trip to Glasgow. While I’m sure a few more of you have been to Edinburgh rather than the big G, I loved it, and I promise I’m not just saying that. If I were to describe it in two words, I’d say it was surprising and underrated. 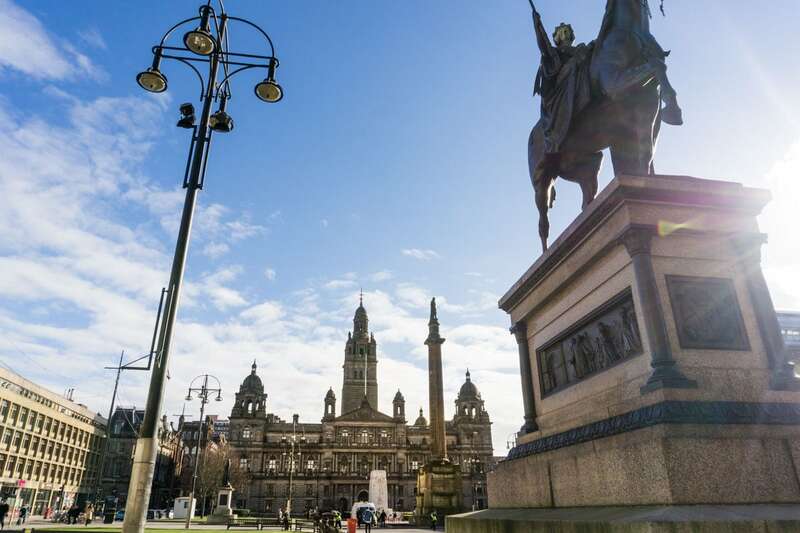 The biggest surprise… how beautiful Glasgow is! I marvelled at the stunning Victorian architecture, medieval cathedral and broad shopping streets. I snapped endless photos of works by Charles Rennie Mackintosh, Scotland’s most celebrated architect and designer of the 20th century. I captured blue skies and epic views of the city from both The Lighthouse and the Glasgow Necropolis. And as for the fairy lights? I don’t think I’ve seen a city use so many strings of twinkly lights. It was so magical at night! 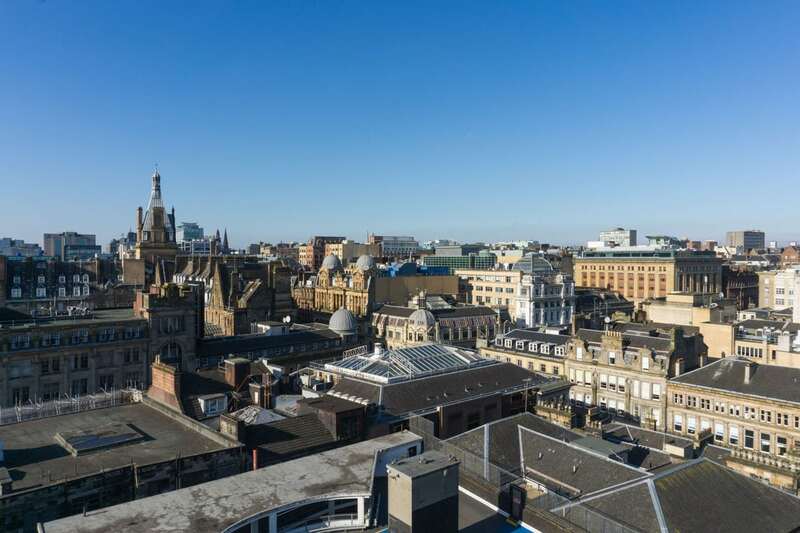 So budge over Edinburgh, it’s time to put Glasgow in the limelight. I also loved the creative vibe in the city. 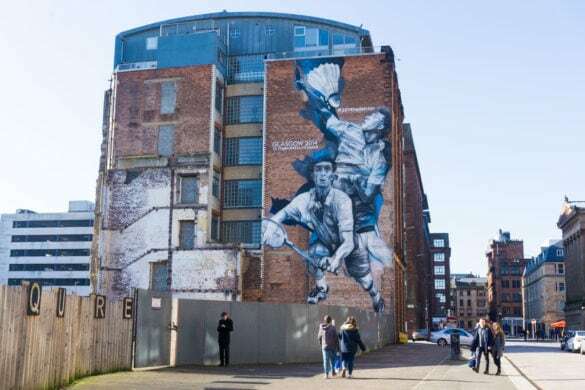 From the enormous murals on the buildings, to the artists and creators working in The Hidden Lane, the imaginative, independent spirit was undeniable. The food – oh the food!! 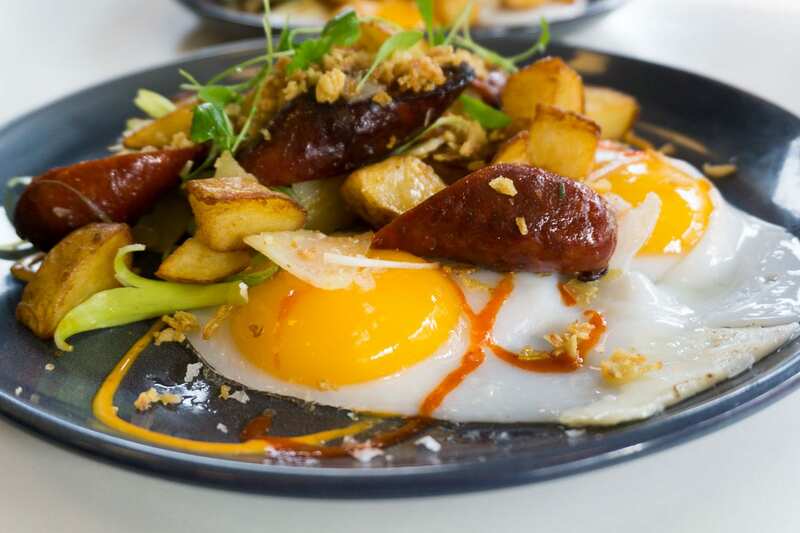 Glasgow is a foodie city filled with gorgeous brunch spots (top marks to Café Strangebrew for their chorizo hash!) 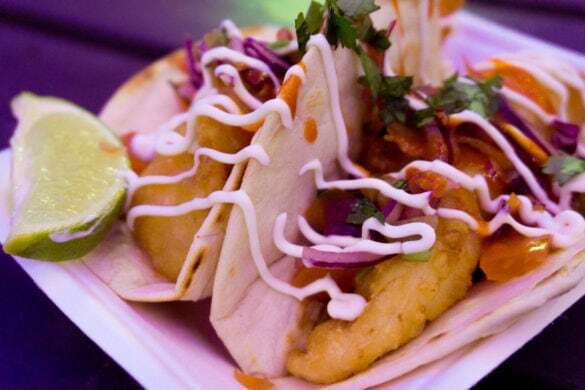 gourmet offerings and street food. To be honest, I hadn’t heard much about this scene before visiting, but perhaps the locals were trying to keep it a secret! Finally, the people. Glasgwegians are SO friendly. In London, people are so busy. They keep themselves to themselves and rarely look up from their phones. In Glasgow, people stopped for a chat, helped me with my bags and one guy even went out of his way to show me the best viewpoint of Glasgow Cathedral. There’s a real warmth in the city as a whole and in some ways, that’s enough to make me want to go back! 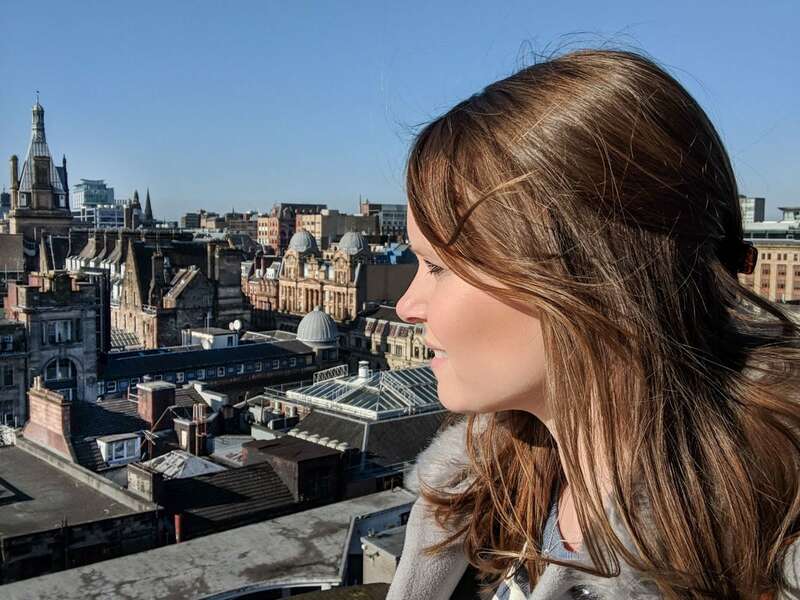 For a quick flavour of my adventures in the city, check out my video, then scroll down for my top things to do in Glasgow. The award for my favourite brunch in Glasgow goes to Café Strangebrew in the city’s Southside. The food is next level, generous and full of flavour. Oh and the coffee is strong, frothy and everything you need to start the day. I’d recommend the chorizo hash with fried eggs. It’s a hearty plate of yumminess! There were plenty more appetising dishes on the menu including baked eggs with various extras, pancakes and standards like avocado on toast. There’s also a specials board which featured dishes including confit duck leg hash and a BBQ benedict made with ox cheek. Another lovely spot for brunch, Wilson Street Pantry in Merchant City was heaving when I stopped by on a Sunday afternoon. They have a menu of toasts topped with delicious ingredients. I went for the avocado and hot smoked salmon with poached eggs, but was very tempted by the parma ham and fig toast too! There’s a lovely vibe in this place, with big tables and lots of chit-chat. The perfect weekend hangout! I was about to leave Glasgow when my friend Amy (Little Magpie), a Glasgow local said “You can’t leave without seeing the cake table at Singl-end” and promptly marched me up the hill! 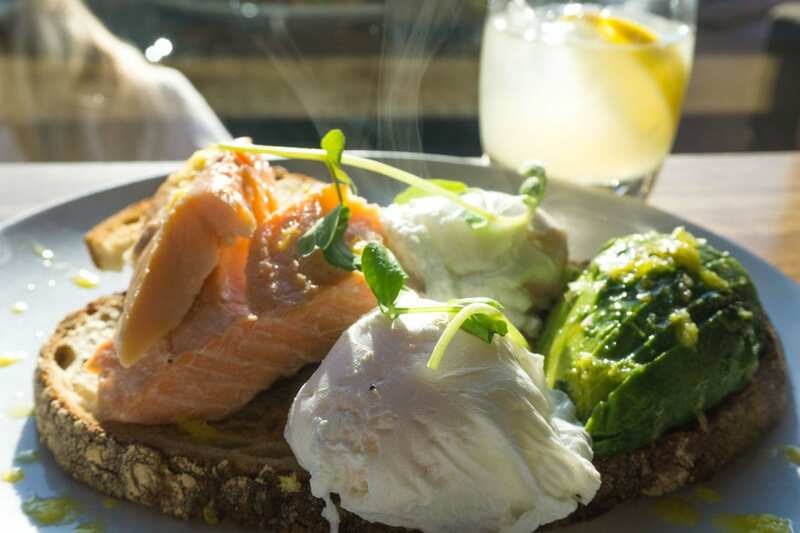 This café is another buzzy spot, and a great place for brunch, lunch or a cuppa and a slice of cake. She visits regularly because they have plenty for her gluten free diet, plus they also have lots of vegetarian and vegan options. Don’t worry though, this isn’t a super healthy spot! 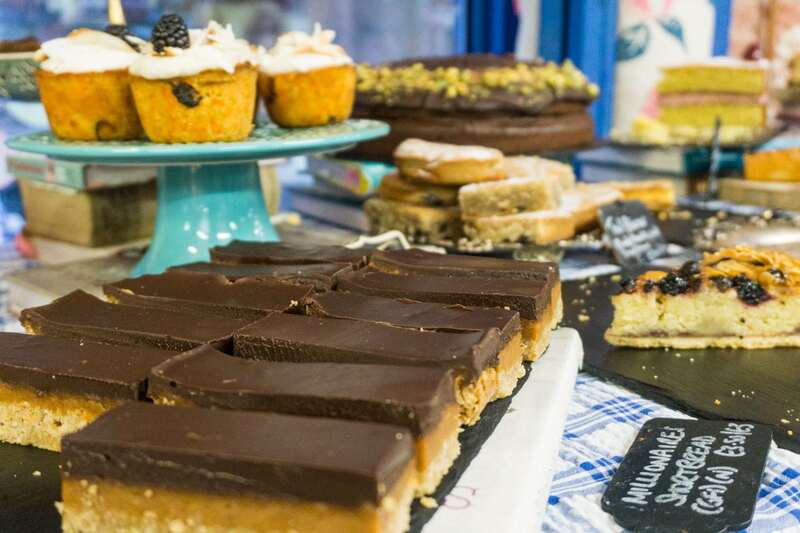 You can get the most indulgent of cakes and pastries, and yes… she was right – you can’t leave Glasgow without seeing the cake table! I popped by Hillhead Bookclub while shopping in the West End of Glasgow. It’s a very cool spot, with arcade games, ping pong tables and a relaxed vibe. I tucked into a triple decker vegetarian club sandwich. It was massive, with tasty hummus, mozzarella, pesto and a chickpea fritter inside. While I visited on a quiet Monday afternoon, I’d love to revisit in the evening as I could tell it’d be a great spot for drinks with friends. 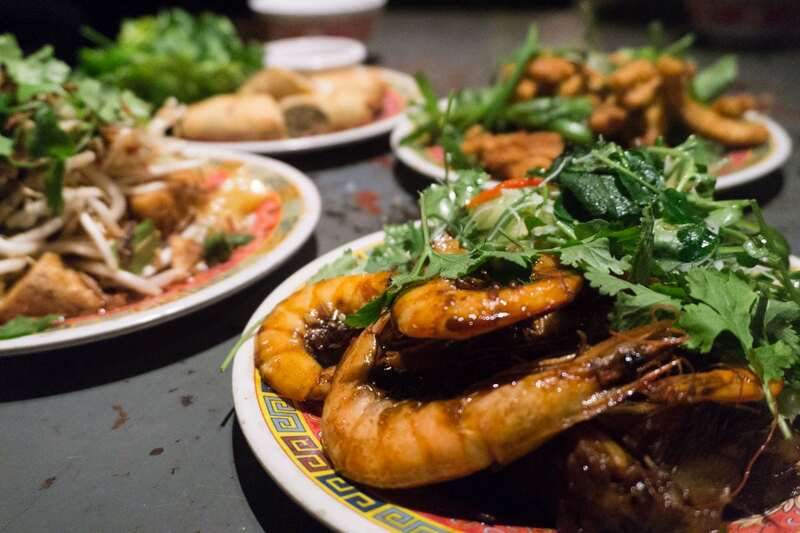 Tasty Vietnamese food in the heart of the city! Tucked down a side street in Glasgow’s West End is The Hanoi Bike Shop. 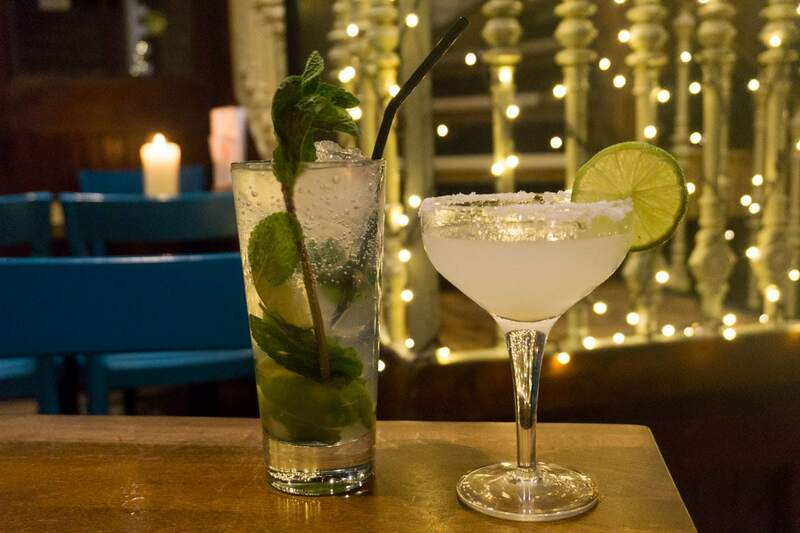 Grab a few friends and head here for cocktails and a million dishes to share. It’s easy to get carried away with their street food menu, and it wasn’t long before we’d totally filled the table with tasty snacks. We enjoyed the fried squid with chilli and salt, the lemongrass poussin, fried prawns and crispy spring rolls. They also make their own tofu, and while I’d never been a huge tofu lover before, theirs was tasty – slightly sweet and fried with spices. We never made it to the pho menu, but that’s what I’ll try on my next visit! 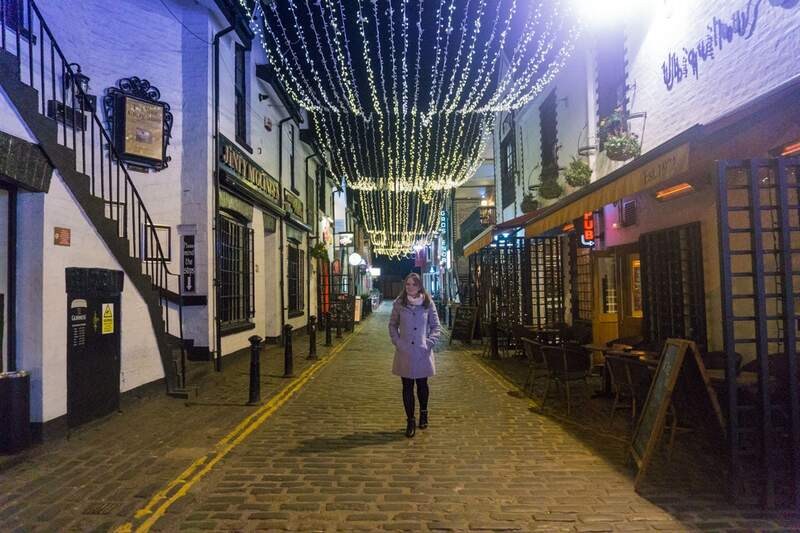 Wandering Ashton Lane at night has to be on your Glasgow to do list. It’s so magical, with its cobble stones and fairy lights. There are plenty of bars and restaurants along the street, but we headed to Brel Bar – a cool cocktail bar and restaurant. There’s a huge garden out the back (perfect for warmer months) but we settled inside near the cosy fire and… more fairy lights! 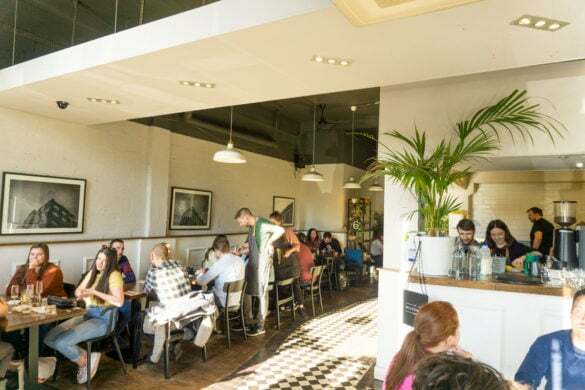 One of the best ways to appreciate the design genius of Glasgow’s Charles Rennie Mackintosh is to head for tea in Willow Tea Rooms. There are two sites to visit, but I headed to the one on Buchanan Street and enjoyed breakfast downstairs, before venturing up to the incredible blue Chinese Room for a coffee. It’s an absolute must-do in the city! 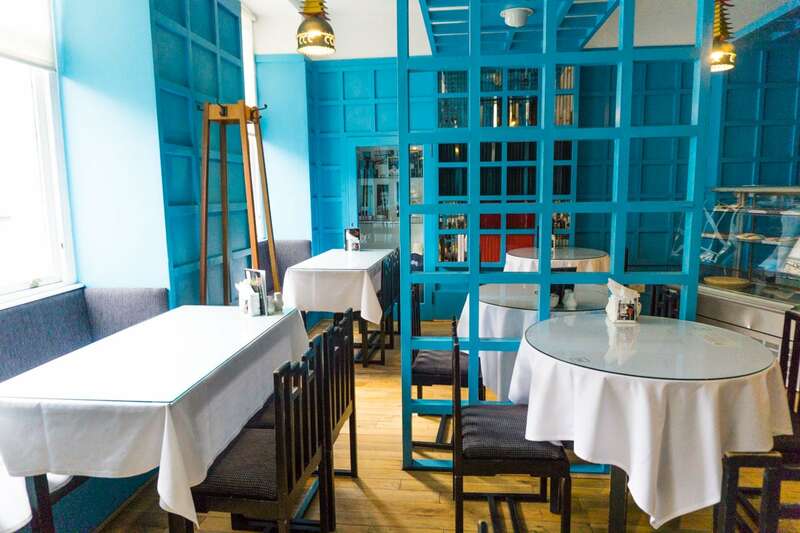 Along with the beautiful décor in the blue room, I loved the chairs – such icons in the city, some with high backs, other with geometric cut outs. 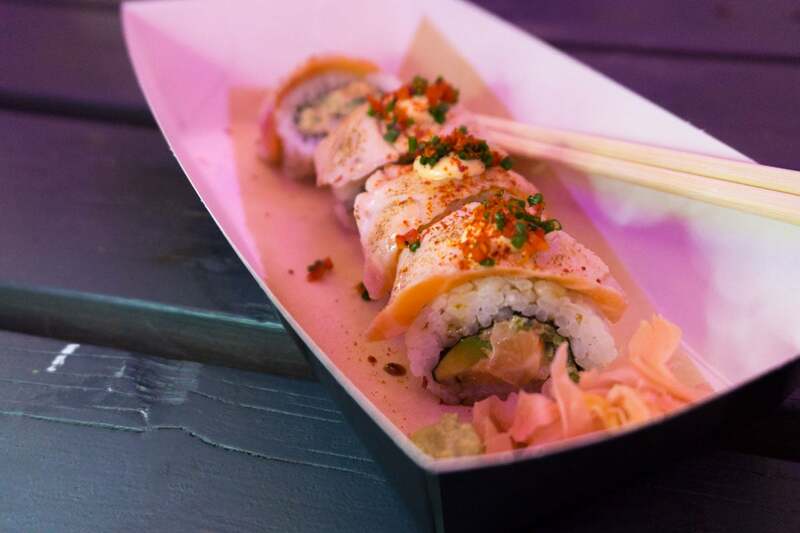 If you love street food as much as me, you’ll love one of Glasgow’s newest foodie spots! 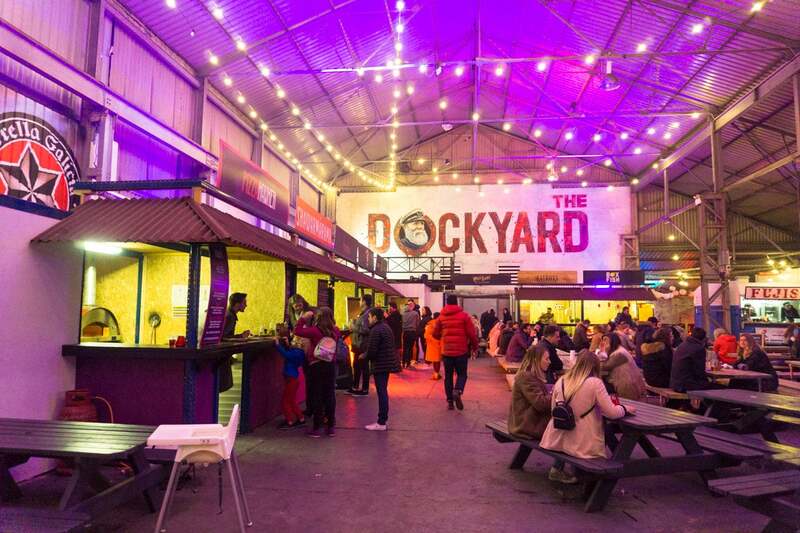 The Dockyard Social currently runs every other weekend (no doubt that will increase soon as it growns in popularity) and once inside the warehouse venue, you’re faced with the challenge of choosing between tasty fish tacos, spicy sushi, pizza, katsu curry, indian snacks and more! There were ten vendors when I visited, but they change regularly, so you could never get bored. 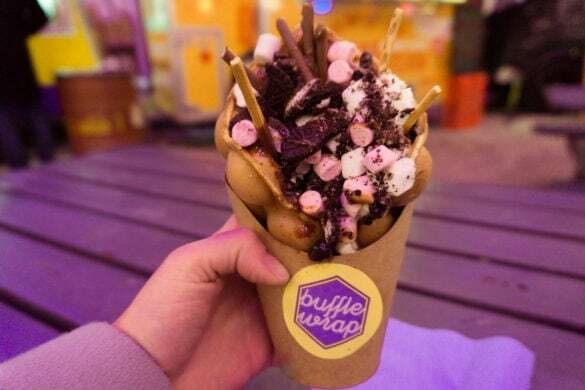 You can’t visit and NOT try a bubble waffle. They’re as messy, naughty and indulgent as they look. It was also great to meet the guys behind this project, who have heart-warming plans of transforming the area by opening a training kitchen for homeless and those living in poverty. I wish them the best of luck, it would be an amazing addition to the community in that area of Glasgow. As a street art fan, I love that Glasgow has its very own mural trail. You can grab a map or follow the directions on the website, and head off on your own street art tour of the city. 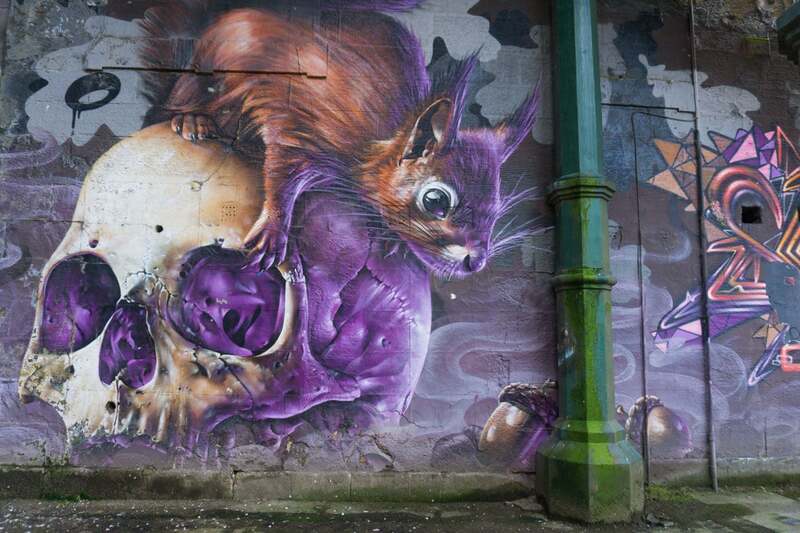 Many of the creations are by Rogue-One, an amazing graffiti artist from Glasgow. 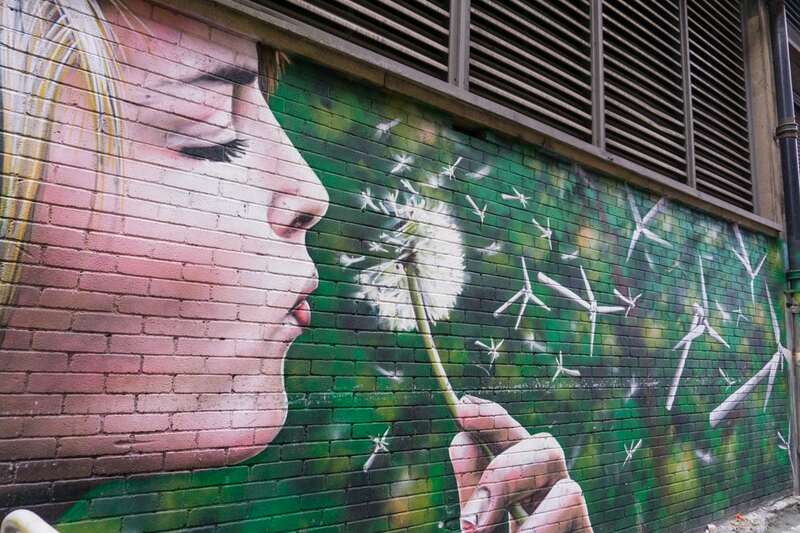 I particularly liked ‘Wind Power’, which features a girl blowing a dandelion that transforms into wind turbines. 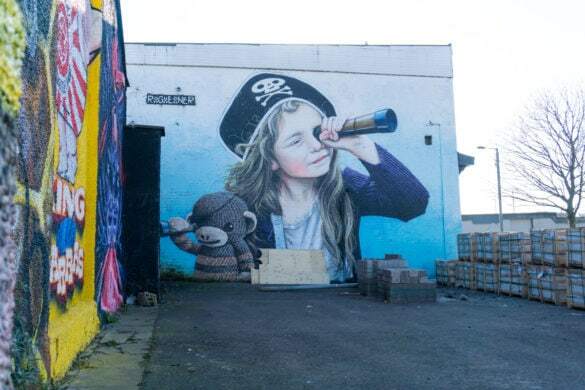 ‘The Barras Pirate’, also created by Rogue One was really impressive, meanwhile it’s hard to miss ‘Honey, I Shrunk The Kids’ – a huge artwork moments from The Lighthouse. Sundays were made for visits to places like this! 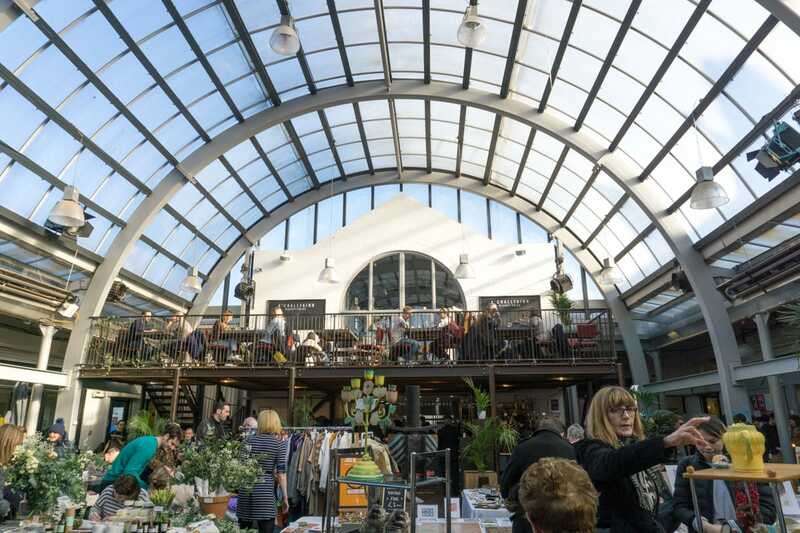 This weekend market in Glasgow’s East End is housed inside Barras Art and Design, a stunning building with a curved glass roof. Inside is a treasure trove of vintage clothes and nic-nacs, from vinyl to cameras and vases to broaches. If you visit, be sure to stop by Braw Wee Emporium, a lovely gift shop selling 100% Scottish items. Owner Jennifer recounted how the store had started with just a few items but had really developed and grown in popularity. She was immensely proud of the creative talents in Scotland, and it was a lovely place to pick up some gifts to take home. Kelvingrove Art Gallery and Museum is a worth a visit for the architecture alone. The stunning museum opened all the way back in 1901 and has been a big attraction for tourists and locals ever since. Exhibits are varied, and on my visit included paintings by Rembrandt and Van Gogh, a hanging spitfire, an exhibit about rainforests and one about Glasgow-born artists! The most photographed feature ? 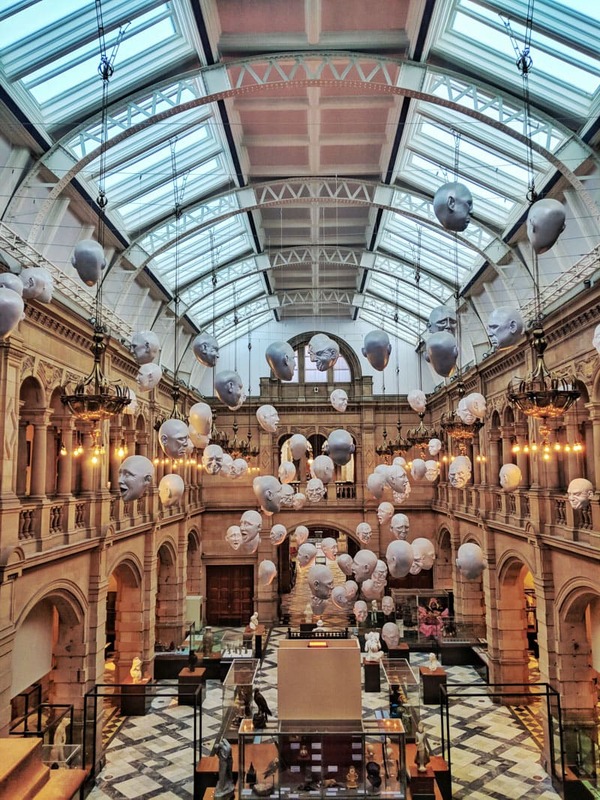 The floating heads installation by Sophie Cave. There are over 50, displaying different emotions including laughter and despair. 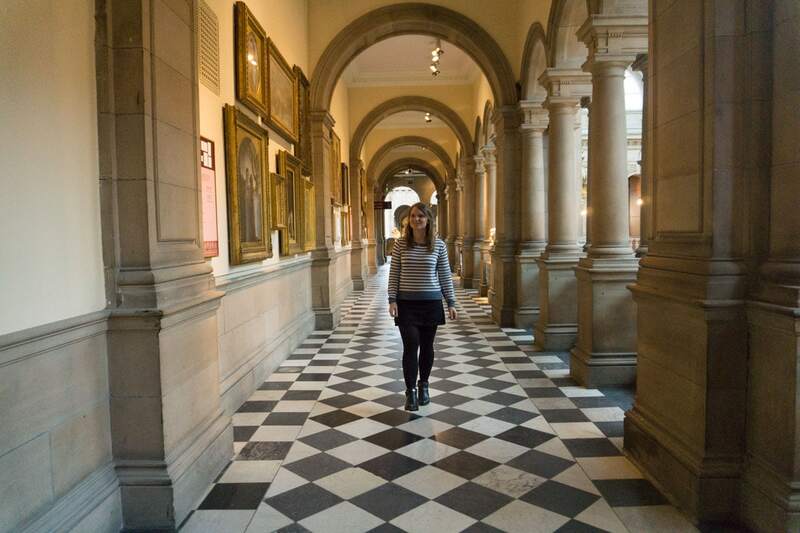 It’s a stunning museum to wander the corridors of, so allow time to take in the architecture, along with the exhibits too. One of the most creative spots in Glasgow, this colourful area in Finnieston is a real hidden gem! 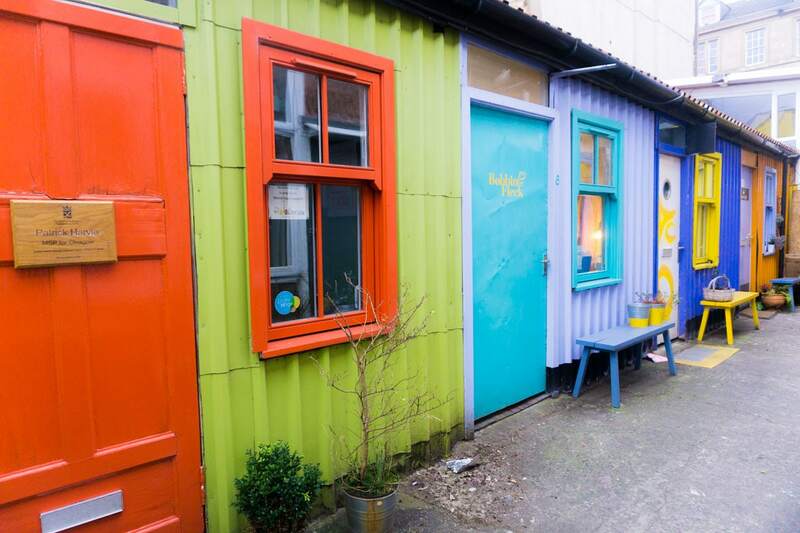 There are around 100 studios tucked away off Argyle Street, with jewellery, illustration, art, baking and more all happening in this fun little hub! You can pop in and watch the creators at work, book a course to learn some new skills or head to the tearoom and enjoy a cuppa and a slice of cake. 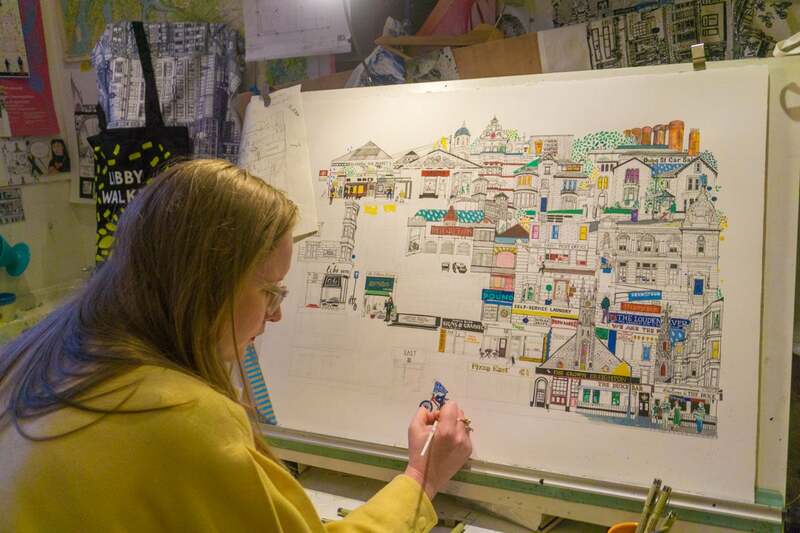 I loved seeing illustrator Libby Walker in action, meticulously detailing her quirky illustrations of places in Scotland. The colourful jewellery at Bonnie Bling was a lot of fun too. It was also wonderful to meet the team at Vanilla Ink, a jewellery company who have been successfully running courses and helping people develop new skills. 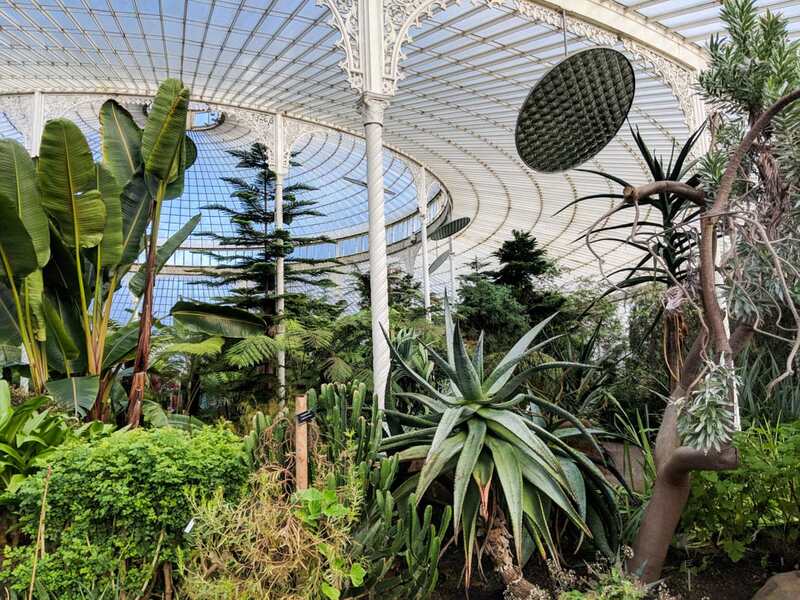 There are plenty of free attractions in the city, and Glasgow Botanic Gardens in the west end is one of them. Step inside and enjoy a wander through the toasty atmosphere, checking out orchids, ferns and other greenery. 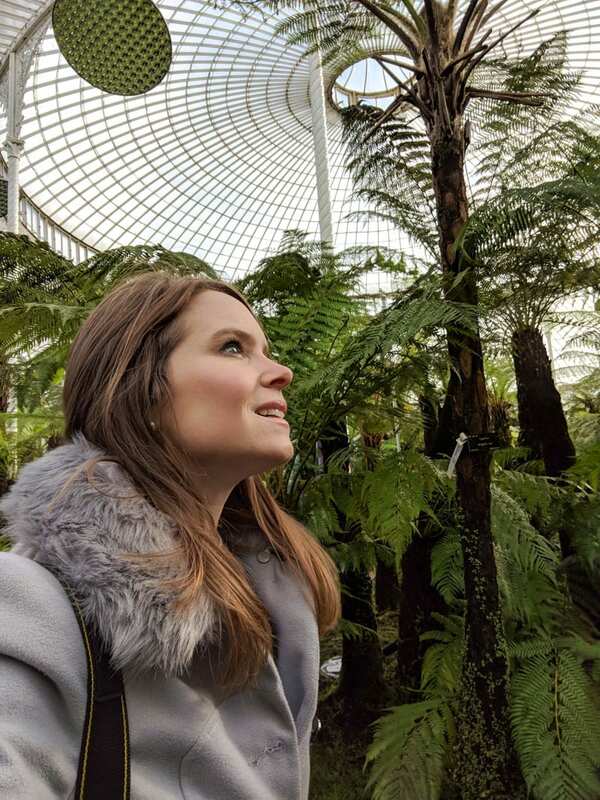 The Kibble Palace is beautiful inside and out, and definitely worthy of a few snaps for Instagram! 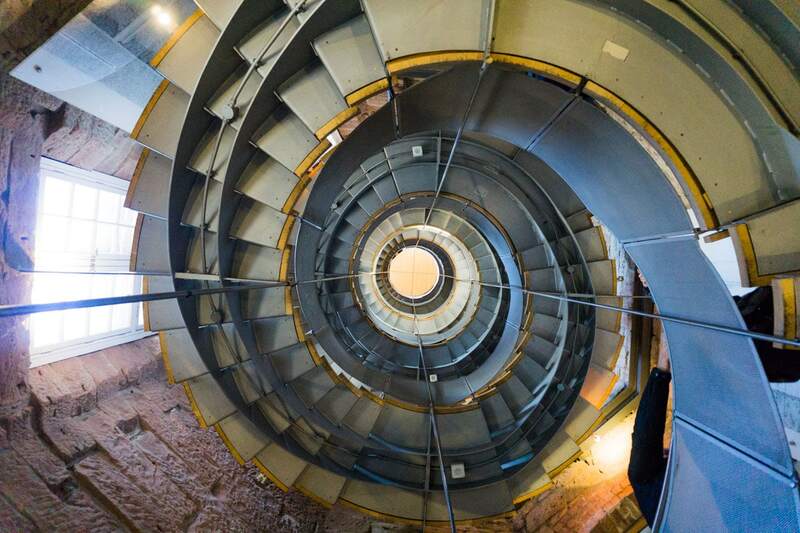 The Lighthouse is Scotland’s Centre for Design and Architecture and as it was the first public commission completed by Charles Rennie Mackintosh, it’s the perfect place to begin a Mackintosh tour of Glasgow. Moments from Buchanan Street (Glasgow’s busy shopping street) it’s a wonderful place to head on a sunny day. After climbing up one of the most Instagrammable staircases I’ve seen in a while (an amazing spiral creation) I emerged at the top of the tower and enjoyed stunning views of the city. On a clear day you can see for miles! Meanwhile, downstairs there are galleries and exhibitions to check out too. 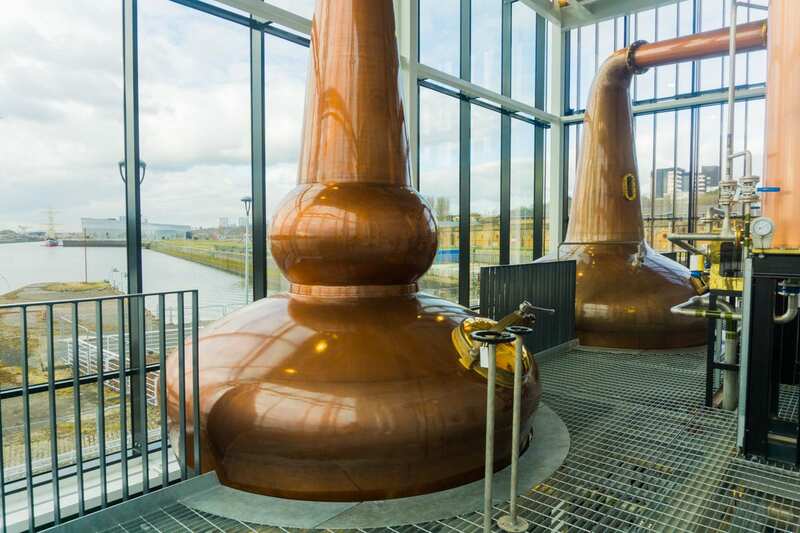 Newly opened, this distillery in the old pumphouse right on the dock in the west end is a fantastic addition to Glasgow’s lengthy history in whisky production. I headed off on a tour to learn more about the area’s history, the city’s connection with whisky through the ages, and to see some of the machinery at work. Then it was on to the tasting room for a sip of three different Scottish whiskies. The perfect way to get a dose of Scottish spirit before heading home! I stayed at the Apex Hotel, a stylish city centre hotel that provided a great base for my time exploring the city. 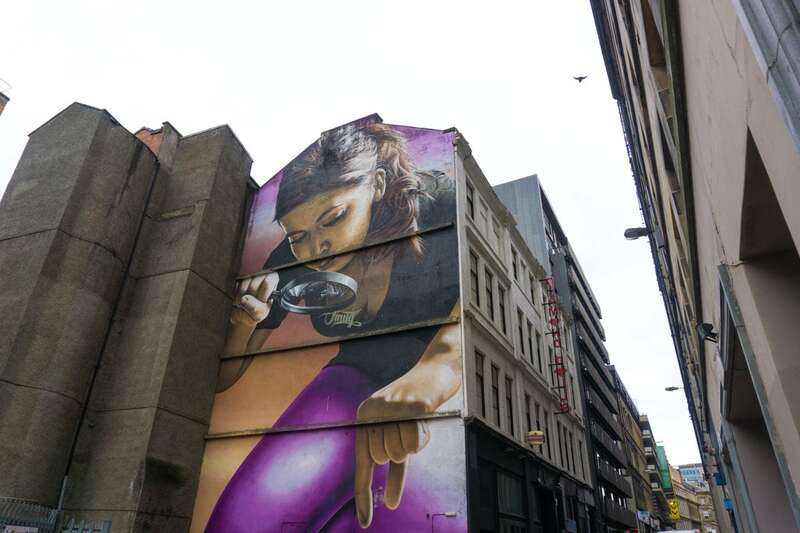 I visited Glasgow in partnership with peoplemakeglasgow.com as part of the #NextStopGlasgow campaign. As always, all opinions are my own. Enjoyed this post…? Pin it! Glasgow sounds like such a fun city! I hope you have an amazing time! I really loved it up there!